Victory Powerpills 3000+ is an energy and resistance-supporting vitamin preparation, containing vitamins B and C, ribose, folic acid, chlorella and ginseng extract. Victory Powerpills 3000+ is rich in vitamins B, C and folic acid which have a reinforcing action on the nerves, keep the muscles healthy, and are important for the good functioning of the defence system. 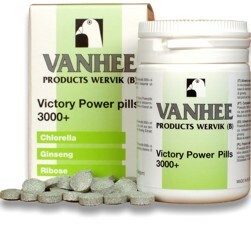 Victory Powerpills 3000+ mainly contains chlorella, an alga having the powerful concentration of all feed stuffs (aminoacids, vitamins, minerals, proteins, enzyms, oligoelements and nucleinic acids) and restores the deficit of these. Chlorella has a high content of vitamin B12, protein, iron, calcium and zinc. Chlorella reinforces the immune system thanks to its extraordinary composition of essential materials, restores the intestinal flora, and improves the functioning of the intestins, purifies the blood and stimulates the forming of blood. Chlorella helps against tiredness and stress. Ribose has an extremely high energetic value so that there is a surprising improvement of the endurance, it supports the forming of muscles, and it improves the physical condition. Ginseng extract is a natural, stimulating substance improving the power, increasing the resistance to infections and stress and stimulating the muscles. Ginseng extract enhances the urges (stimulates the urge of mating), builds up physical condition, and accelerates the recuperation power. - Tube of 150 pills.